Robert McBeath – A Hero on many continents. When he was sixteen years old, Robert McBeath, lived in Kinlochbervie, Scotland. He lived with his adopted parents, Robert MacKenzie and his sister Barbara MacIntosh. World War One had been raging for one year. McBeath was eager to fight and told the recruiters that he was eighteen. He was accepted, and joined the Seaforth Highlanders Regiment in Scotland. On November 20th 1917, he was a two-year war veteran. He was fighting with his unit, in the battle of the Somme, in Cambrai France. The Seaforths took part in the first battle ever carried out with massed tanks and easily broke through German lines. The Germans counter-attacked the next day and recovered all the ground they had lost. The Seaforths were pinned down by intense gunfire from several machine gun nests and suffered heavy casualties. Lance-Corporal McBeath volunteered to attack the guns alone, armed only with a Lewis gun and revolver. He stormed the first machine gun nest, killing all the enemy soldiers. He was joined by a tank and then attacked the other four machine gun nests in succession and silenced them as well. The remaining enemy soldiers fearing they were under attack by a larger force retreated from their trench into the shelter of a tunnel. The Highlanders warrior blood was hot, he fearlessly pursued them into the tunnel and shot the first one dead who tried to fight; the remaining three officers and thirty soldiers surrendered to him. As a result of his heroic action he was awarded the Victoria Cross. Prior to the Seaforths going over seas, they were reviewed by the Duke of Sutherland. The duke promised “croft land” to every man who returned, and a farm to who ever won the Victoria Cross. When Robert McBeath returned home to Sutherland he was given a hero’s welcome. The people of Sutherland treated him like a lord and presented him with a silver tea service. He renewed his love affair with Barbara MacKay, daughter of Williamina Morrison MacKay, widow of John, a fisherman. They were married on February 19th 1918 in Edinburgh. Robert was awarded a farm as promised by the duke but it was not for him. Seeking more adventure he sold the farm and emigrated with Barbara to Vancouver. He first joined the British Columbia Provincial Police and then several months later the Vancouver Police Department. After his death Barbara was home sick and moved back to Scotland. She remarried and died childless in her mid-forties as Mrs. Alec MacDonald. She is buried in Scourie Sutherlandshire. This information was gleaned from the web site of the Vancouver Police Museum and the story was brought to our attention by a keen reader J. McEvoy. 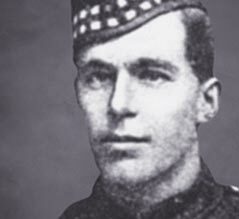 Although Robert McBeath was not a Canadian when he was awarded the Victoria Cross he certainly did contribute to the fabric of Canada as a Police Officer. Robert McBeath stormed the first machine gun nest, killing all the enemy soldiers. He was joined by a tank and attacked the other four machine gun nests.